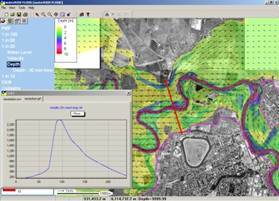 waterRIDE™ FLOOD Manager is a purpose built floodplain management support system. 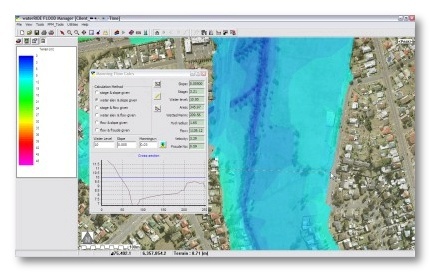 Based on the waterRIDE™ time varying GIS environment, it supports the results of any 1D or 2D flood model. With its intuitive interface, accessing model results has never been easier. 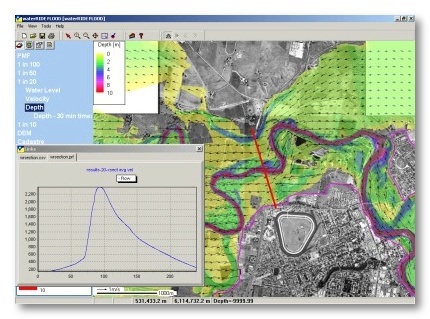 In essence, waterRIDE™ FLOOD Manager’s role is to help in the understanding of flood behaviour (for both technical and non-technical people) by allowing users to “get at” and interrogate their model results, and integrate them with GIS datasets to help determine “what do they mean?”. All this without needing to be a flood modeller, nor have the flood model software available! It is not a flood model itself. The capabilities of waterRIDE™ FLOOD Manager extend far beyond those of a simple hydraulic model results viewing application. waterRIDE™ FLOOD Manager is designed to enhance the understanding and communication of hydraulic modelling, as well as facilitate decision making by providing targetted flood intelligence through seamless integration of modelling results with GIS datasets. 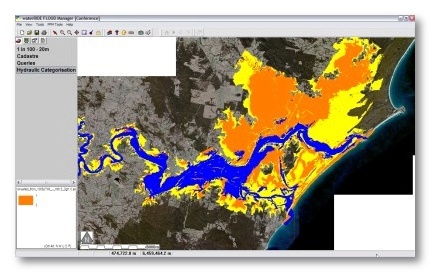 Flood intelligence is the combination of flood modelling datasets with other, generally GIS based datasets, to create new information that serves the needs of the end user of the model results (ie “what does this flooding data mean to me?”). Developed by experienced floodplain managers actively practising in the industry, it is designed to be used by hydraulic modellers, flood mitigation engineers, planners, emergency management personnel and flood risk managers, in both government and private enterprises. 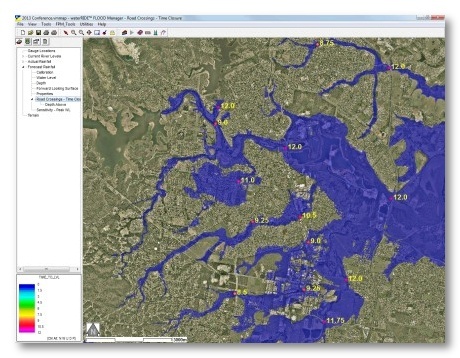 From model results interrogation and communication, to planning and development assessment, floodplain management and real-time flood forecasting, waterRIDE™ FLOOD Manager provides ready access to flood information when it’s needed. Currently supported models include: TUFLOW, TUFLOW FV, MIKE11/21/FLOOD/SHE, RMA2, InfoWorks RS, Isis 2D, SOBEK, DELFT 3D, FLS, time-varying ASCII grid output, HEC-RAS, XP-STORM, EXTRAN (XP-SWMM), DRAINS overland flow, ESTRY, ANUGA, ICPR and even hard copy results. Using waterRIDE™ FLOOD Manager, 1D models can be interpretted in 2D with realistic (and interactive) animation of flood behaviour over a georeferenced background. Regardless of the model type (1D or 2D), you can access your model results in the same intuitive and highly visual manner! This allows you to interrogate all hydraulic parameters at any location in the floodplain, not just at model nodes or cross sections. Realistic, interactive animations are invaluable in understanding flood behaviour. Interactive animations can be paused at any time to interrogate the active results or any GIS layers. They are not “movie files”. Full GIS controls are available during animation (eg pause, zoom into an area of interest, then restart the animation). Interactive animations are particularly valuable in community education and emergency planning. Clickable “time series plots” at any location allow the user to readily navigate to particular time steps in the animation. Save and load your time series points for comparison between different model runs. Profile plots of any parameter provide valuable insight into hydraulic behaviour. Export the profile to your spreadsheet application. Translucent thematic mapping enables the visualisation of thematic surfaces and underlying imagery, simultaneously. Easily stack multiple profile plots from different flood events for quick comparison. Flow plots across any user defined section allows the user to visualise the time variance of flow at any location in the model. 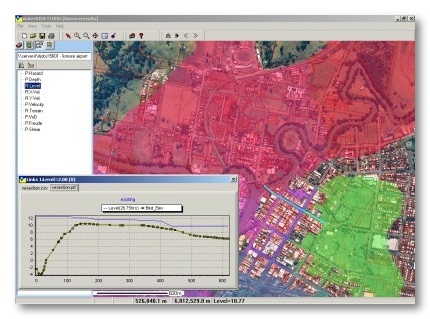 Quickly control the display of and access to any hydraulic dataset. Customisable colour palettes, contour intervals, translucency levels and labelling provide you with the flexibility to display your data the way you want to. 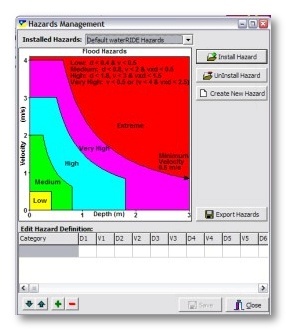 User controlled Table of Contents provides intuitive access to flood information. Project files allow quality controlled distribution and access to flood datasets across an organisation. Flood hazard (velocity x depth) can be converted to a cadastral format, instantly defining flood hazards for each cadastral lot. Set up your own flood hazards categories (charts) to provide ultimate flexibility. 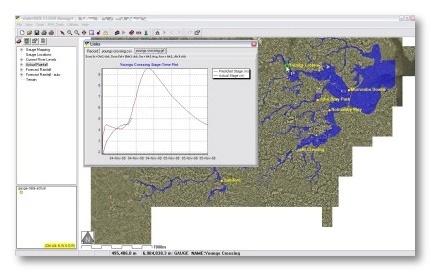 waterRIDE™ FLOOD Manager can be used to easily produce difference plots. Difference plots can be used to thematically display the difference between two model runs (eg in development impact assessments with ‘before’ and ‘after’ model results, or what is the impact of climate change?). The model results do not even need to have the same network layout or even be from the same hydraulic model! Full Boolean logic query functionality for your hydraulic results set, at any time step or across the entire time series. 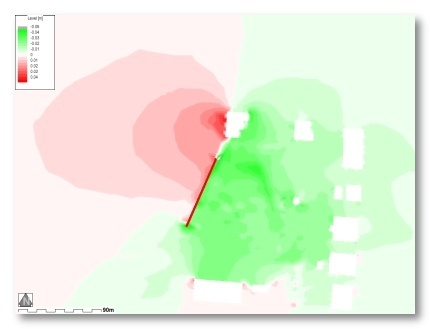 For example, display all points in the floodplain where velocity > 1.0m/s and depth > 1.0m at any stage during the flood. Facilitates ready classification of your floodplain (floodway, flood storage, flood fringe etc). Interrogate the results across the entire floodplain. An absolute necessity for effective emergency management planning and flood hazard/risk analysis! 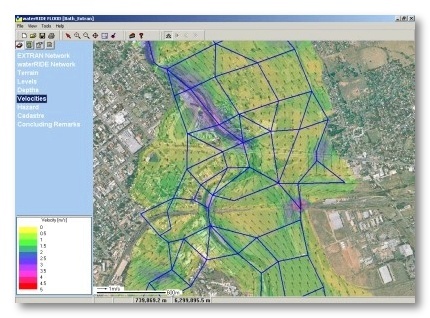 Combine your GIS datasets with your model results in even more sophisticated ways. 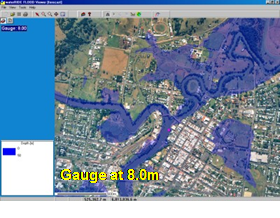 Populate a GIS field with any hydraulic parameter for all objects in the GIS file (eg automatically mapping maximum flood levels and hazards to all properties in the floodplain, including across large rural lots). 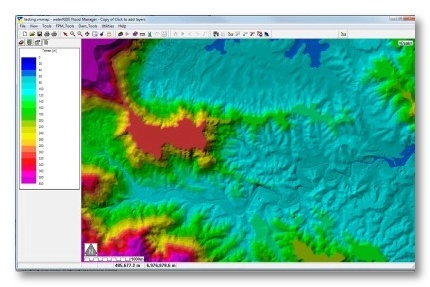 Export any surface as a vector or raster GIS layer. Automatically calculate a flood planning level for all cadastral lots (in a GIS file) in the floodplain (eg the 1 in 100 year ARI level +0.5m). 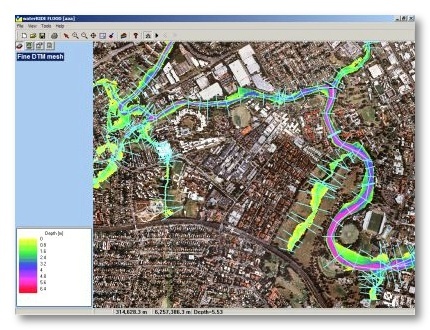 The GIS capabilities of waterRIDE™ FLOOD Manager allow model surfaces, georeferenced property data and corporate database systems to be read and combined automatically in the production of flood certificates. Flood certificates use standard Microsoft Word templates with keywords for the automated insertion of relevant data. You can update your certificate formatting at any time. 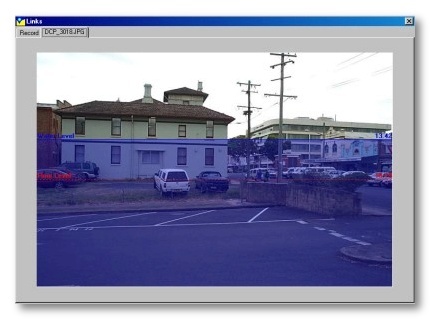 Automatically display individual property photos for GIS property information layers. 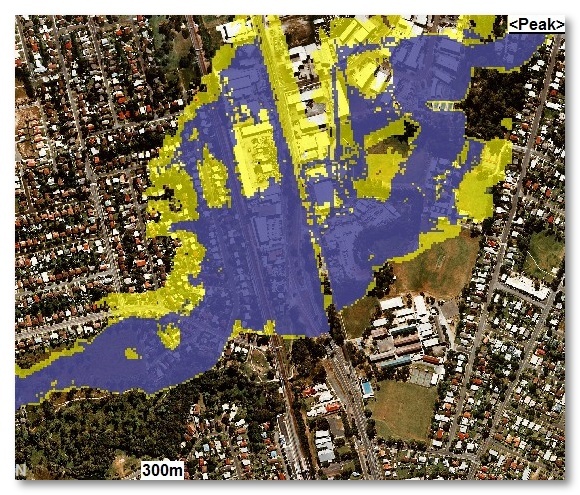 Scale your property photos to provide a realistic visualisation of flooding at each property. Fantastic for use in community flood awareness and education campaigns! 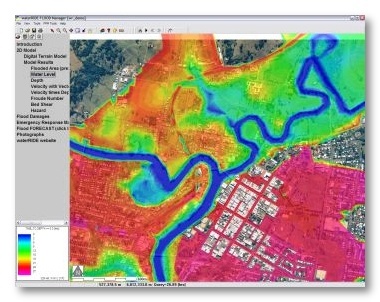 waterRIDE™ FLOOD Manager supports both triangular irregular network (TIN) elevation models, and raster (grid) elevation models with thematic mapping of the ground surface, elevation retrieval at any point and extraction of cross-sections. You can even have TIN model results ‘floating’ on a gridded DEM! 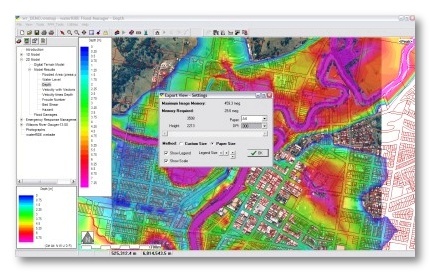 Map the model results over a fine scale DTM (such as ALS or LIDAR) to enhance flood depths, extents and hazards. Plot outputs using user defined drawing templates specifying borders, graphics, logos, text etc. 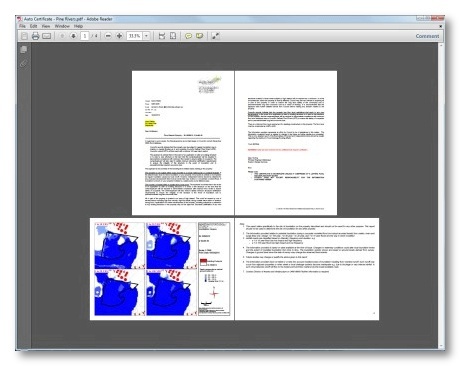 Readily export high quality images at the desired print resolution for direct insertion and annotation in reports. 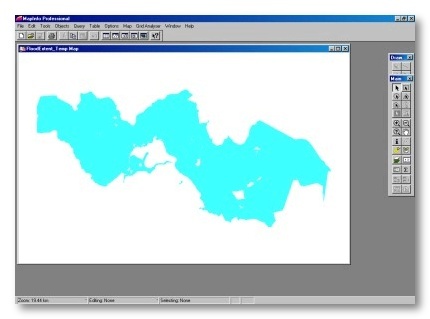 Export high quality screen images at varying resolution, including saving GIS header files! 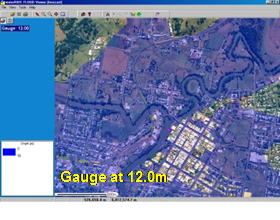 waterRIDE™ FLOOD Manager can be used to interpolate a surface representing the likely flooding for a given gauge(s) prediction. Detailed information is available on the Flood Forecasting page. Current Support: TUFLOW, TUFLOW FV, MIKE11/21/FLOOD/SHE/URBAN, RMA2, RMA10, RMA11, InfoWorks, ISIS, SOBEK, DELFT 3D, FLS, SELFE, RiverFlow 2D, time-varying ASCII grid output, HEC-RAS, XP-STORM, EXTRAN (XP-SWMM), DRAINS overland flow, ESTRY, ANUGA, ICPR, and even hard copy results. 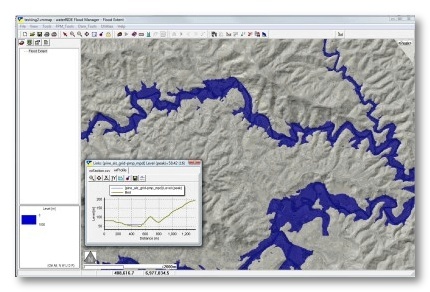 The main aim of waterRIDE™ FLOOD Manager is to make flood data usable… by anyone. Essentially, this means anyone interested in, or needing to use flood model data in their role should find waterRIDE™ FLOOD Manager (or Viewer) valuable. As this encompasses a very wide range of user types not all functionality will be applicable for all user types. The lists below provide an indication, through user feedback, of the features that each of the user types has found valuable. waterRIDE™ developers are hydraulic modellers. The tools are used in their own modelling work and are continually enhanced. waterRIDE™ FLOOD Viewer provides access to any waterRIDE™ project developed using waterRIDE™ FLOOD Manager. Users can view and interrogate model results (thematic surfaces, profile and time series plots etc) but are unable to change or edit the project (add views, new layers etc). The viewer cannot access any of the sophisticated processing tools (but can access the outputs of the tools). It provides an ideal means of sharing quality controlled flooding information across an organisation with minimal (or no) training requirements. waterRIDE™ 1D Surface is required if 1D model results are to be used (excluding HEC-GeoRAS and the 1D component of TUFLOW, as these are converted directly to 2D). Both standalone and network (LAN/WAN) licenses are available.